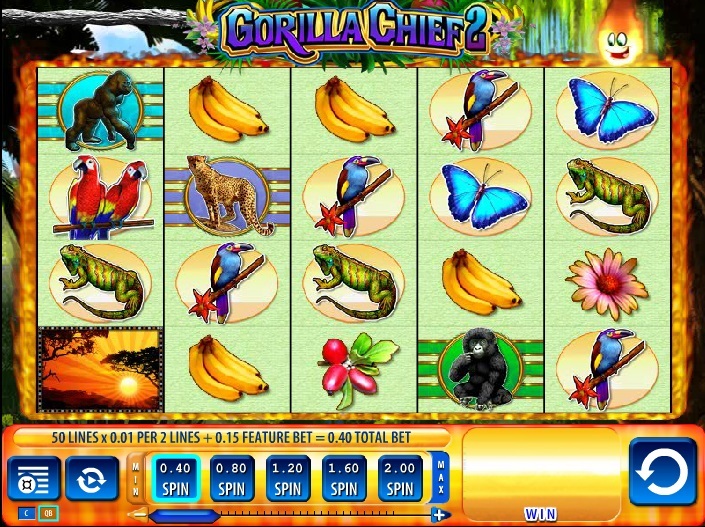 The Gorilla Chief II slot game is a slot designed by WMS and as such you will find you can access it in both land based casinos all over the world and also at quite a number of instant play online casino sites too. However, this slot is an unusual one for you are forced to have to place a forced side bet wager when playing it and that will give you the ability of triggering a base game feature, a description of which you will find below. Therefore, when playing it, as this slot comes with 50 pay lines that you are charged one coin for each two pay lines, then a max bet minimum stake spin will cost you a total of 40 coins per spin. You can of course increase the stakes you are playing for from a low of just 0.40 in your own home currency up to a maximum cost per spin of 200.00! The slot has a wild symbol on reels 2, 3, 4 and 5 and those symbols will stand in for all others except the Feature scatter symbol, so when they spin in they can help you form multiple winning combinations. When you have spun in on the first reel a set of matching stacked reel symbols then a re-spin feature is triggered, all of the matching symbols on the screen that match the ones on reel one will be locked onto the screen and the reels will then re-spin. As long as you spin in additional matching reel symbols to the ones locked into position you will then be awarded with additional re-spins, when a re-spin is played off and no additional matching reel symbols spin in the feature will end and the slot will then award you with all winning combinations formed on the screen. You need to spin in three of the Feature scatter symbols on reels one, two and three to be awarded with a free spins bonus game, and when those symbols do spin in a set of 10 free spins are awarded to you. Those free spins play off on the same stakes as you had in play on the base game and during the bonus game you can not only trigger the re-spin feature but you can also re-trigger the free spins too. Plus, for the duration of the bonus free spins game additional extra wild symbols will be added onto the reels to increase your winning chances. As the Gorilla Chief II slot game has a published and fully certified RTP of 96.01% that makes is a very playable slot game as you will get plenty of winning chances whenever you give it any amount of play time. Being a 100% random slot anything can and probably will happen when you play it however. The Re-Spin feature can at times be very frustrating however, for the aim of the bonus feature is for you to not only spin in other matching reel symbols when the reels re-spin but you will need to see them lining up on a pay line, which they may not always do! However, the more you play this slot the more exciting a slot playing session you will have, and thanks to the Re-spin feature there is always the chance that you will get a screen full of matching reel symbols! Also we did notice that many of the reel symbols pay the same amount when spinning in a matching set of three, four or five of them which is rather unusual, but it is certainly a slot worth playing!